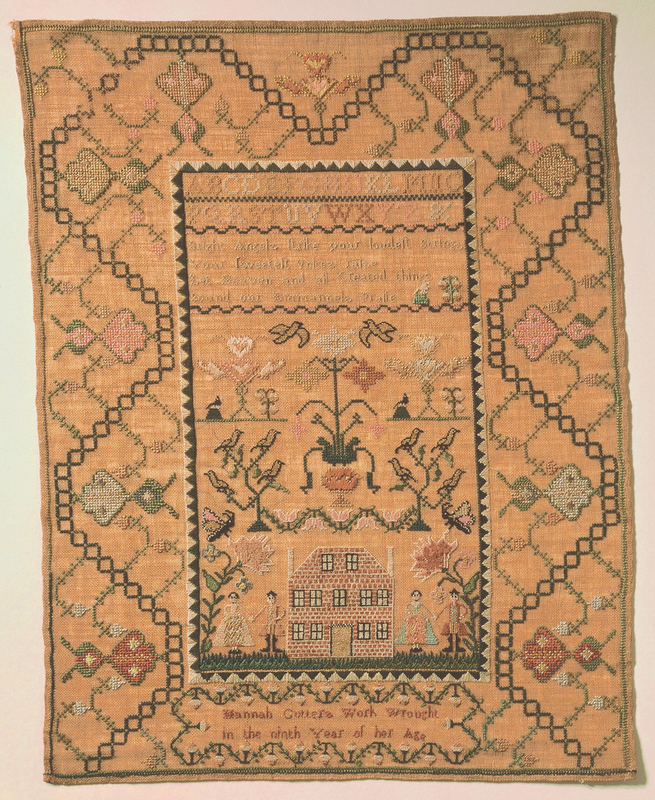 Hannah Cutter’s sampler is part of a large group of related examples worked from about 1790 until at least 1805 in Boston or nearby towns in Middlesex County. Typical characteristics of these samplers are deeply arcaded borders surrounding a central panel comprising an alphabet, verse, and pictorial elements framed by a saw-tooth border. The pictorial elements include some variation of a house, figures, trees, and birds. Hannah’s central image of the stylized flower-pot also recurs on other samplers from this group. The sampler most closely related to Hannah’s, an undated example by Dorcas Stearns (1780-1859) of Lexington, Massachusetts, is in the collection of Glee Krueger and was illustrated in her book New England Samplers to 1840. Another related sampler, made by Betsy Adams (1941-69-86) and also undated, is in the collection of the Cooper-Hewitt. A needlework instructress has not yet been associated with this group of samplers. It is thought that their makers may have attended an area boarding school. It is also not possible to identify Hannah Cutter with any certainty. Her work is undated and there were several girls by that name born during the last two decades of the eighteenth century in Middlesex County. We curious as to how this sampler is now located in Salem, Oregon?